This design is intended as a D&T electronics project for groups at secondary schools, or after school clubs. 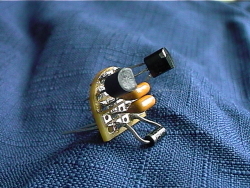 It is an exercise in soldering to make a moving robot (instead of one of those ubiquitous plant watering indicators! ), which hopefully provides a cheap but gratifying practical project to get kids hooked on practical sciences and engineering. No it doesn’t fly, but it does twitch its wings every few seconds as it basks in sunlight. The sun’s energy is collected by the solar cell, which is stored in the blue capacitors that make up the body. 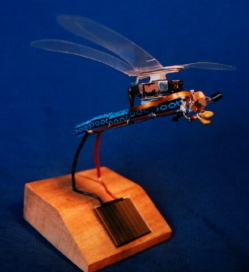 When the capacitors are fully charged (as detected by the various components that make up the head, eyes and mouthparts), this accumulated energy is released into a small electromagnet to make the wings move. 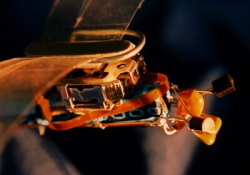 Children are often intimidated by technology, ("Its broken so I'll buy another one" - rather than "I'll see what's inside and try and mend it") so the dragonfly is deliberately aimed to allow them to get inside some hi-tech equipment.